Chances are that (unless you’ve been living under a rock – which is totally cool, by the way!) 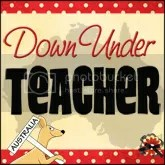 you’ve probably perused the selection of teacher resources on SALE on TeachersPayTeachers over the last 48 hours. There’s still approximately 5 hours left to save up to 28% off all items in my store. Just use the code TPT3 on check-out to get an extra 10% off my already 20% off items! So, a little while ago I stumbled onto the OrganizedJen blog and (instantly fell in love) started watching a lot of her video blogs entries. She’s got a lot of great idea and tips and showcases a lot of products I’ve never heard of before. Like the Sigma Spa Brush Cleaning Glove above. Now, I’m not GREAT with make-up, I’ll admit that. I’m even worse with cleaning my brushes, but this looked really easy to use (and is quite quick) and cleans my make-up brushes so well that I splurged and bought it and I totally do not regret it. (I got mine off eBay). Jen has a great video on using the Spa glove on her blog. This was another idea I pinched from the OrganizedJen blog (click link for post). She uses this cute Orla Kiely make-up bag (from US Target – I got mine on eBay… sensing a trend here people?) as a ‘planner suitcase’. Now, my planner (an Erin Condren teacher planner) doesn’t fit inside this case 😦 BUT, my kikki.K 2014 Weekly Diary (a gift from a student/family last year) DOES, as well as all my much-loved pens, post-it notes and washi-tape accessories! And I use all of these things WITH my teacher planner, so now I carry around everything I need in a pretty, light-weight case, with my planner and I’m ready to go. It’s all part of my plan to be better organised! This week I caved and finally bought my new Macbook Pro Retina laptop… (it should be arriving on Monday!!! ), but also some accessories. A purple SmartShell (I also have a Mickey Mouse laptop decal on the way, too! ), a spare laptop power adaptor (one for work, one for home) AND (in the brown box) a SuperDrive because seriously, I will NOT function without a DVD drive. People, I know that it seems stupid, but I ADORE watching movies on my laptop while I’m working. It’s so hard to find high quality, Australian-curriculum linked apps so this is just FANTASTIC. This will be put into maths activities this week, because it has multiplayer options for up to 4 players making it great for group work (especially since I only have my own personal iPad in the classroom). I am dying in anticipation of the Foundation app being released. Seriously – people, I’m on the edge of my seat! Kudos to Pascal Press, who’ve great an amazing serious of apps. So, that’s it from me for today! I hope you’re all having a fabulous start to the weekend! 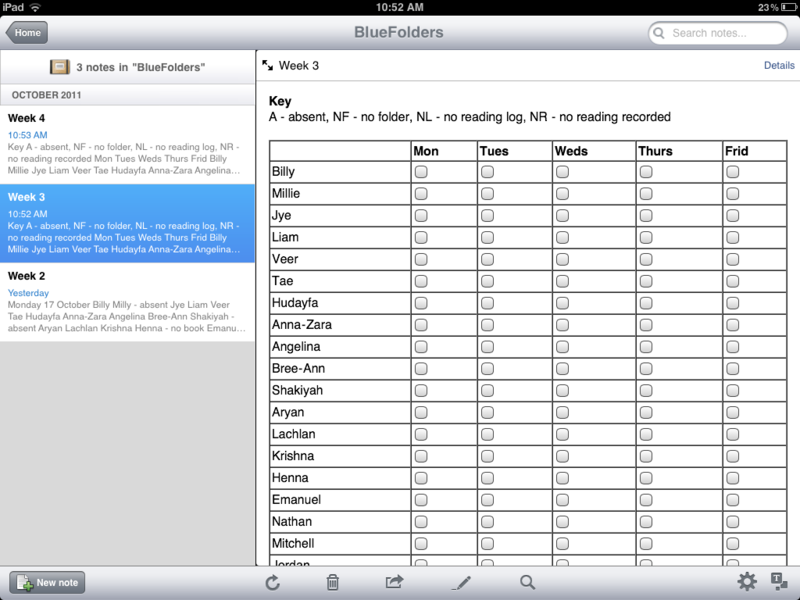 A few weeks ago I posted about a few iPad apps that I’ve used with my Prep class. On that list I included 2 “virtual tour” style apps – Please Touch the Exhibit (Melbourne Museum) and MSO Learn (Melbourne Symphony Orchestra). I wanted to expand on those a little bit, and add in an extra one that I’ve discovered in the last few days. This app is a fantastic way to re-live an excursion the Melbourne Museum, or to allow students who may not have the opportunity to visit the museum to view some of it’s most memorable exhibits. From skeletons and fossils, wild animals, Indigenous culture, and other bits of Victoria’s history, students (and teachers!) can explore high quality photos, simple exhibit captions and a few interactive puzzles along the way. Just wait until they stumble across the photo of Phar Lap! Earlier this year the Grade 1/2s visited the MSO as part of their Integrated Studies unit. I wish I’d known about this app then, because it would have just added so much to their experience. There are 3 ways to experience the MSO through this app: by orchestra seat (a great visual representation of the orchestra sections), by musician, and by instruments. While it is very text-based, it does give an insight into the MSO, and would be great for anyone studying music. When exploring through the “Take Your Seat” option, there are great samples of each instrument. 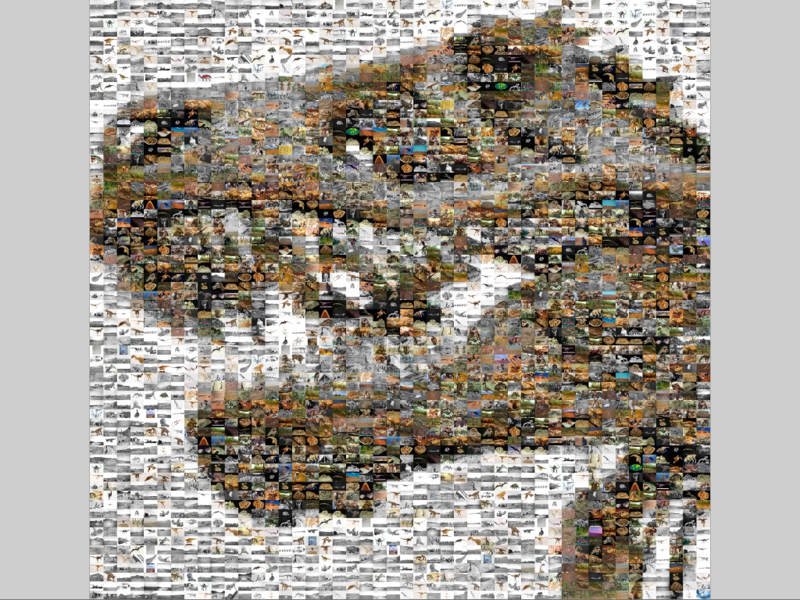 Produced from the American Museum of Natural History’s collection of over 800 archive images, the Dinosaur Mosaic is stunning to look at, and even easier to navigate. 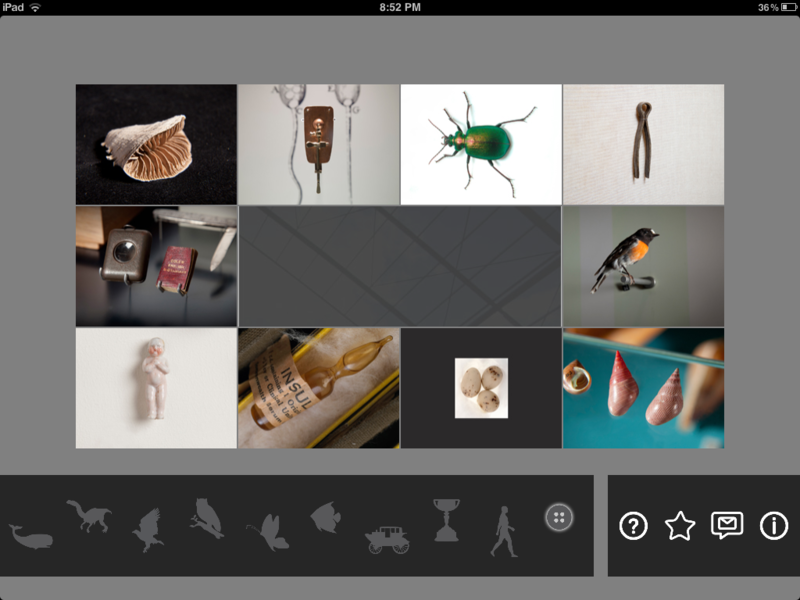 Simply pinch and double tap to navigate through each image and it’s associated information. There’s also the option to sort by dinosaur name. I’d love to know if you’ve come across other similar style apps! 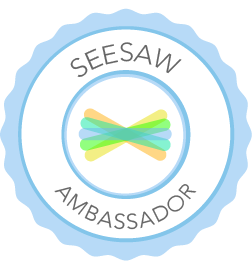 I don’t profess to be a revolutionary on how to integrate and embed iPads into the classroom. I have my own personal iPad that I use with my prep students when I feel it’s relevant, when I want to try something new, or when I think it can bring another level of engagement to my lessons. I’ve had lots of people ask what apps I use in the classroom, and what is to follow is a list, with simple descriptions of how I’ve used the apps in lessons, plus some e-books and other bits and pieces. Keep in mind, this is a work in progress! Create a Car and Carve It! – Great games, where you can design a fantastic automobile in your own style, or carve an individual jack-o-lantern! Paid apps, but very engaging for students (as both end products are animated). Great for creating story or description prompts for writing. Dr. Seuss e-books – really can’t say much more other than that Dr. Seuss is one of the most popular authors in my classroom and my students listen to these over and over at listening posts. Have been able to tie them in really well with rhyming word activities during Literacy rotations. Glow Draw – an alternative to a simple drawing app – draw on a black screen with fluorescent colours. Magnetic Alphabet – Create words/sentences using drag-and-drop magnetic letters. Melbourne Museum – A virtual tour of the permanent exhibits at the Melbourne Museum. My students loved exploring the different sections – although they were unanimously enamoured by the photo of Phar Lap. It prompted quite a side trip into one of our favourite icons! 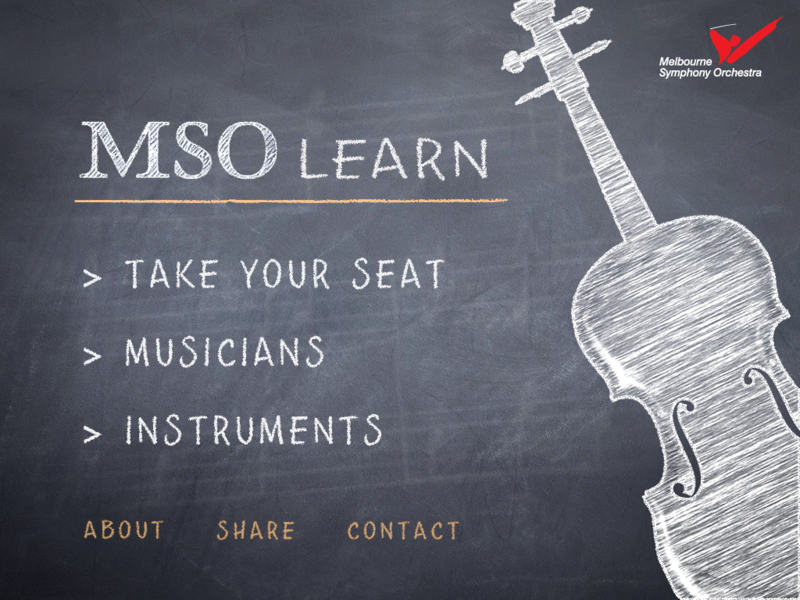 MSO Learn – Learn about the Melbourne Symphony Orchestra, the performers and the instruments. Newstand – Subscription to National Geographic Kids. Mostly for my more confident readers, but I have used it with all my students, this NG Kids magazine is great for simple, interactive, vibrant and kid-friendly content. SingingFingers – A great audio and visual art app for younger students. Record noises as you draw and replay the sound by retracing your earlier drawings. Sock Puppets – Everyone has heard of this, but honestly my students fell in love with it. They LOVE the puppets and hearing how their voices are changed after the recording. Spelling Magic 1 and 2 – Great for learning short vowel sounds and CVC and CVCC words. 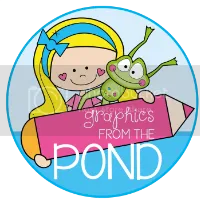 Storychimes e-books – lots of e-book stories that can be read independently or with the audio on. We’re doing a unit on fairytales and it’s been great to listen to these as listening posts or during eating times at lunch. Quite a few of them are free, and there are a few free matching games as well. The Three Pandas – My students loved this e-book, which is an altered Goldilocks and the Three Bears story. Interactive and animated in parts, too. Toy Story – their e-book of choice (they’re 5, so I can’t begrudge them!). Wonky Donkey – another great e-book that can be listened to as a story or in song-format. Great sound effects that my students love. 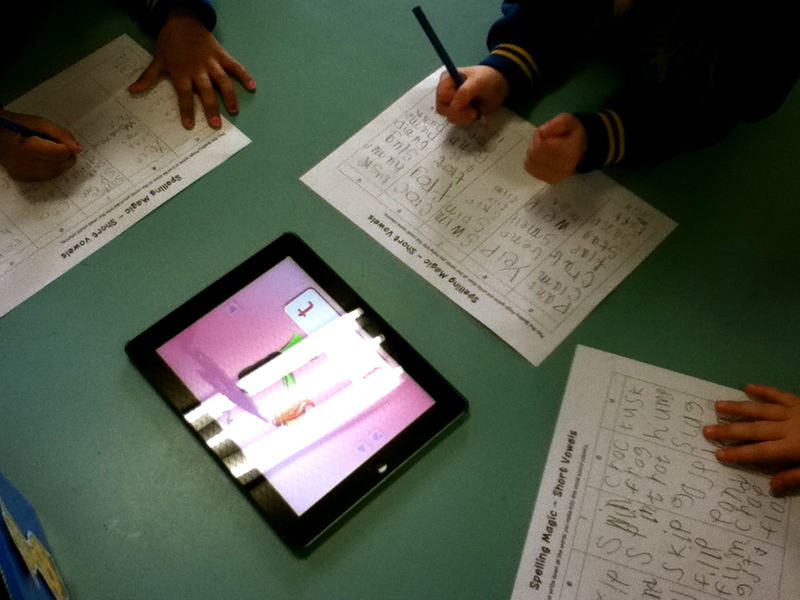 Word Bingo – great sight word practise. Zoo Who – Great for creating wildlife scenes and building stories. Overall I do believe that the most useful app for younger students on the iPad (or iPhone/iPod touch/etc) is the Camera app. Not only can students easily take a photo of short video footage, but it’s quick and easy to download to a computer to view or print out and provide excellent support for writing and digital literacy activities. Do you use an iPad in the early years? Share some favourite apps (please)! Last week, MissSpinkOnTech shared a great way to use Evernote in the classroom. The idea was was pretty simple – create a simple checklist without the hassle of paperwork. Like so many other teachers, paperwork is part of our daily lives. I, however, am not so great on the paperwork front. I really loved how @MissB6_2 had come up with a simple way to check off when her students returned their readers during the week. I grabbed onto this idea, because my goal at the moment is to be more organised than I currently am. And with report writing looming (what, you mean I should have started already?!) and a deadline on the Contemporary Literacy Project knocking on the door (this weekend’s project), I needed a better system than I already had. So, I took a leap of faith and launched my first foray into Evernote-usage on the iPad! It was quite successful and I’m glad I had a go. This is something small that I can continue with for the remainder of the year. And, hopefully, expand on next year! That’s not to say that my first attempt was perfect… I have since redesigned my checklist so that it’s easier to view across a week. Checklist Attempt #1, followed by the re-designed table! What other ways could we use a tool like Evernote for in the classroom? This term I’ve been ‘road-testing’ mobile learning devices in my prep classroom. This is in part due to a research project my school is participating in, funded by the DEECD’s Innovation department, and partly inspired by my own grand ideas of using technology. This morning I was listening to Shelly Terrell‘s webinar at SimpleK12 on “Read World Learning Through Mobile Devices” (at 5am!) – which was particularly fortunate timing for me, given my exploratory use of an iPad and iPod Touch in the classroom. I also particularly enjoyed Shelly’s ebook Effective Mobile Learning (50+ Quick Tips & Resources). 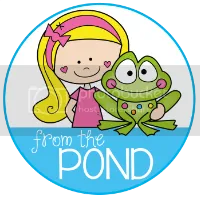 Now, a very quick overview of my class: I teach a class of 22 preps (5-6 year olds) in a government school in the Northern Metropolitan region of Melbourne. I have a wonderful mix of cultures within my classroom, a small number of ESL students, and a wide range of abilities (both in traditional curriculum areas and also in using technology). A handful of students have iPod Touches, 1 has an iPad that he shares with a sibling, a few more occasionally play on their parents’ iPhones, and about half the class have access to a computer (desktop or laptop) at home under parent supervision. Since the start of this term, I’ve spent quite a bit of time incorporating at least 1 literacy-based technology activity into my literacy rotations (school wireless permitting!). I’ve been very pleasantly surprised by the way all of my students have worked together to respect the rules of using these devices, and have demonstrated great cooperative skills and a willingness to be involved. Needless to say, the enthusiasm of the group using the iPad outweighs most of the other activities! An interactive ebook story (The Three Pandas) – students listened to the story, touched the screen to interact with the characters. At the end of each session the groups discussed the story, relating it to other stories they knew of (Goldilocks and the Three Bears), talking about the differences between the ebook and a traditional paper-based book. We also connected it to our IWB and watched it as a class. 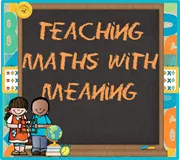 Watched (downloaded) YouTube videos appropriate to lessons (including nursery rhymes, counting rhymes and other fun little videos based on sounds and word play). Used Halftone to take photos and create a one-page poster with a descriptive sentence. I worked with each student one-on-one (and quite a few of the students worked together, teaching each other, too!) to explore how to take a photo and how to edit and create text in the Halftone app. They then saved these photos to iPhoto and printed them in colour to make a classroom book. They were able to show (and demonstrate) to our Principal – who was amazed at the knowledge and ability of the students after one lesson using the app – and Assistant Principal their creations both on the iPad and then the book. This lead to their introduction to Comic Life during ICT sessions (starting today). This week we’re focusing on short-vowel sounds and are using Spelling Magic 1 (and 2) to listen to and make simple/CVC words using the vowel sounds. The picture at the top of this post is 3 students using the app and recording the words that they hear on a vowel chart. They then took these posters to our desktops (Macs) and (with some help) logged into Voki and created avatars who introduced themselves and shared some of the words from their posters. We’ve put their Vokis onto our classroom blog, to share with their peers, families and members of our school community. Needless to say, they’re all very proud of their work, and I look forward to seeing what else they come up with during the week. I’ve also recorded lots of simple levelled reading texts in Garage Band and uploaded them onto the iPod Touch which, coupled with a headphone splitter, has turned into a portable listening post. What do I have planned for the future? Inspired by Shelly’s webinar, I’m planning on using MouthOff on the iPod Touch (and our mini HD Flip cameras) to record student communications – most likely with them talking about their weekends! A simple QR code hunt – likely to revolve around either our Sounds of the Week or a text response activity. An activity (still in the planning stages) using the PuppetPals app on the iPad. Plus a whole host of other activities that I’m determined to design using lots of apps and the cameras and video functions. I don’t think any of these activities are revolutionary (I see so many fantastic and inspiring activities being posted on Twitter by my PLN on a daily basis, and I feel so behind!) – but they’re a step forward for my school and I’m quite happy to be the one pushing things forward… even just a little bit! As my AP said in the staffroom – a few years ago you would never have thought to have Prep students creating a Voki. And while I do a lot of the set-up and logging in for them – they type in the text and they create their avatars and that’s fantastic to see!